This is a page to say thank-you to Delicious, a very kind person indeed. I had named this site after a program I had seen mentioned many years ago: a name that I found intriguing, both funny and sad. I had never seen the program itself, nor did I know where it came from. 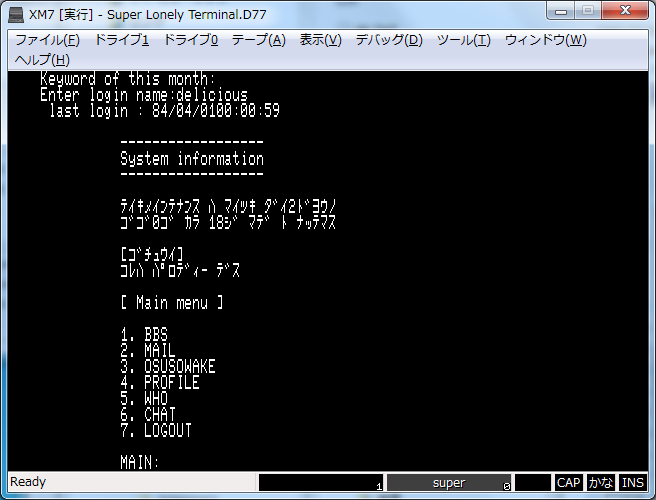 Delicious somehow found that the program was a key-in program from the Japanese Fujitsu-related magazine OH!FM of July 1987.
typing in the program via hex-codes, and put it up on the Tokugawa forum together with instructions. Below I have put the article scan up ( slightly reworked ) and Delicious' program and instructions. So now I have the real deal - the original Super Lonely Terminal, thanks to the most generous and kind efforts of Delicious. Super Lonely Terminal is up.